This email update is part of Havering Council's Cleaner Havering campaign. Havering Council has invested more than £100,000 in a new fleet of street cleaning machines, in a major boost to the Cleaner Havering Campaign. ​A new £40,000 pavement washer and sweeper will be joined on the streets by three smaller pavement sweepers and three new chewing gum removal machines. The larger machine can also wash down pavement areas and jet wash street furniture such as bins and benches. Thames Water is calling on residents to stop putting fat and wet wipes down their drains after they caused 12,386 blockages in the Borough during the last five years. To try and combat the problem, free fat traps (containers to safely store used fat which can then be put in black sacks) are being offered to residents as part of a Bin It, Don’t Block It campaign. As part of the campaign Thames Water is sending letters to 70,000 residents in Havering advising how to dispose of fat properly. The 'fatbergs' block sewers, causing sewage to flood people’s homes and then needing roads to be dug up to clear and repair the sewers. Wet wipes aren’t the only problem – Thames Water often finds condoms, tights, tampons, cotton buds and syringes in fatbergs too. One of the “problems” of being London’s greenest Borough is that millions of leaves descend in the autumn, covering roads and pavements. That's why Havering Council has invested £38,000 in hiring three large compactor vehicles to be used in a 10-week-long campaign by three dedicated leaf collecting teams across the Borough. This means the regular street cleaning teams can continue with their work, while the leaves collected will be taken to BioMRF at Frog Island where they will be shredded, dried and used for fuel. Gidea Park Primary School (pupils pictured), Rainham Village Primary School and Nursery, The Mawney Foundation School and Upminster Junior School are the four primary schools in Havering taking part in a pilot project measuring air quality across the Borough. Read the full story on page 24 of Living in Havering magazine. Havering Council has been awarded £25,000 by the Greater London Authority to develop plans for a Low Emission Neighbourhood (LEN) in the corridor between Gidea Park and Romford stations. If successful, up to £1 million could be awarded for schemes to improve transport, air quality and public health in the local LEN. From January, Automatic Number Plate Recognition (ANPR) cameras will be in use at the four Reuse and Recycling Centres (RRC), including Gerpins Lane, Upminster, available for Havering residents to dispose of unwanted items. The ANPR cameras will be used to challenge drivers of vehicles suspected of carrying trade waste as each tonne of trade waste fraudulently left at an RRC costs Council Tax payers £130 to dispose of. When visiting an RRC please have your driving licence or current Council Tax bill available as proof of where you live. Further details on recycling centres. ​Havering Council is appealing for information after two lorry loads of waste were dumped in Parklands open space in Upminster in the early hours of Wednesday (28 October). ​The fly-tip was found by the Council’s parks protection officers and took several days to clear at a cost of around £5,000. Fly-tipping is a serious criminal offence with a maximum penalty of £50,000 and/or 12 months imprisonment when the case is heard in the Magistrates' Court, or a five-year prison sentence and unlimited fine if the case goes to the Crown Court. 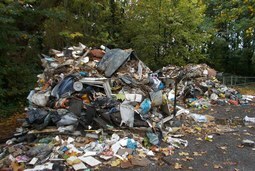 Anyone with information about fly-tipping is asked to come forward by reporting it to the Council online. The Friends of Raphael Park Group is organising a programme of litter picking at the park in Main Road, Gidea Park – do come along and lend a hand on Sunday 15 November. Find out how you can help here. The Bring Bank recycling centre at Orchard Village, Rainham has been given a facelift. You can deposit glass, plastic bottles and tins or cans at the facility. Take a selfie of you making a deposit, tweet it to @RecycleLBH using #greenpoints or post it on Havering’s Waste Prevention Facebook page to claim 1,200 London Green Points, worth £3. We now collect certain small, household, electrical items. Just put them in a securely tied carrier bag and leave them next to your orange sacks on your usual collection day. See the full list of what we will collect here. On average your black sack can contain up to 50% food waste. If you are interested in saving time and money, register for a Love Food Hate Waste cookery workshop. Points collected under the London Green Points – Havering scheme can be redeemed for more than 1,000 sustainable products or donated to local charities. Members can also receive special offers and discounts at more than 100 local businesses simply by showing their London Green Points – Havering card. If you are a Havering resident and not already a member you can join here by clicking on the Register button at the top right. There are a limited number of compost bins and kitchen caddies available exclusively for Havering residents for just £10.99 including delivery charge. London Green Points – Havering members can earn 1,200 green points, worth £3, for ordering a bin and caddy. Order your compost bin here. Currently more than £13 million of your money is spent disposing of waste, with the cost going up each year. Although we now recycle more than a third of waste produced in the Borough, we need to do more. We are committed to weekly rubbish collections but are asking you to leave out no more than three black bags per week to help us save £1 million over the next three years. There is no limit on how many orange bags can be left out. All comments will be fed through to the budget-making process. The full Budget Report can be read here. Are you part of a charitable organisation or community project in Havering and looking for ways to increase your funding? Local Green Points – Havering is looking for new charities to get involved in their waste reduction reward scheme and benefit from residents’ donations. More than £3,000 was donated to local charities through the scheme last year. Applications to get involved will open later this month. To register your interest please email Bethany Fruen so you can be sent more details. Members of 3rd Rainham Scout Group donned hi-viz jackets for a behind the scenes tour of the Ahern depot in Purfleet. During the visit they saw a 40 tonne pile of recycling waiting to be processed as well as the mechanical equipment used in the sorting process and the conveyor belt used for the hand sorting of waste arriving at the depot. Autumn is a time when gardens produce a lot of waste that we can compost if you put it in your Green Bin. 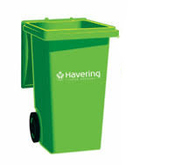 You can now hire a Green Bin from Havering Council at a reduced rate of £21.50 (saving £14), and use the bin until the renewal date of 1 April 2016. There are also discounts available for people over the age of 60, or those who receive certain benefits. 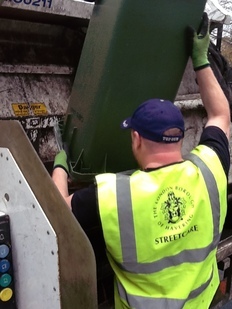 Watch this short video demonstrating the domestic rubbish and recycling collection service delivered by Serco Environmental Services for Havering Council to find out what happens to your waste. A fantastic way to help improve your local area is to organise a community clean-up. Havering Council can help you organise a clean-up by providing posters to promote your event, clean-up equipment and removal of any rubbish you collect. If you are interested in volunteering for a clean-up, email Kim Smith. If you would like to organise your own community clean up, email here. Before you can use Havering Council’s online Report It services you need to sign up for a free My Havering account. Simply click on the link, add your contact details, create a password and wait for the activation email to appear in your inbox, click on that email and you’re ready to use the service. Report an abandoned trolley for a chance to win £300 worth of retail vouchers from Trolleywise. Download the FREE Trolleywise app from here, and then use it to report abandoned trollies, to automatically qualify for the monthly prize draw. Each month Trolleywise contact a winner to receive vouchers from UK retailers. Past copies of Cleaner Havering can be found here. Reporting online is an easy way to help keep Havering clean as your report goes direct to the people responsible for taking action on the issue you raise. This update is sent to you because you asked Havering Council for news on Cleaner Havering. We hope you find this information useful and will encourage friends, family and colleagues to subscribe too. Keep up-to-date with other news from Havering Council by signing up for our award winning email updates then choose the topics that are of interest to you. You can access information on everything happening in Havering by visiting our website. You can also follow us on Twitter @LBofHavering, check out the Havering YouTube channel, see us on Instagram and stay up-to-date with Havering events on our Facebook page.